NON-SMOKING. NO PETS. BEDS: 3 Kings, 1 set of Bunk Beds. 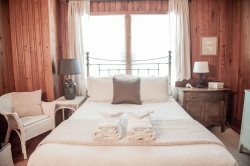 The Beach House rental rate includes a departure cleaning, linens and towels for each room, beds made upon arrival, starter soap and toilet tissue each bath and starter soap, paper towels and trash bag for the kitchen.